Leading Turkish automaker BMC Sanayi ve Ticaret A.Ş. signed an agreement on the sale of 300 buses to Azerbaijan. The deal with Azerbaijan is one of the largest in the history of the company. This was reported to the media by the head of BMC in Turkey, Ethem Sandzak. 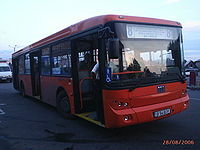 It is reported that the buses will be used in Baku as a city transport.